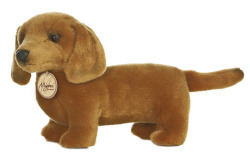 This adorable dachshund is a member of the Miyoni collection by Aurora, a leading manufacturer of plush animals. With its long body, short legs, and cute, floppy ears, its hard to resist! This dachshund is short-haired and brown in color. ?�� Manufactured by Aurora, #10833 ?��11" long ?��Shipping weight: 1 lb. ?��Nicely detailed, high quality piece ?��From the Miyoni collection ?��Soft and squeezable ?��Very cute additional to any collection!